How Do You Spell CARRYING? Correct spelling for the English word "Carrying" is [k_ˈa_ɹ_ɪ__ɪ_ŋ], [kˈaɹɪɪŋ], [kˈaɹɪɪŋ]] (IPA phonetic alphabet). 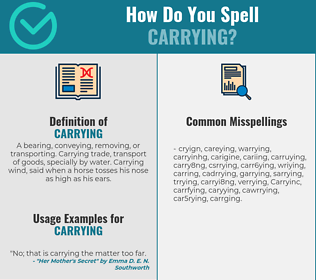 Below is the list of 259 misspellings for the word "carrying". A bearing, conveying, removing, or transporting. Carrying trade, transport of goods, specially by water. Carrying wind, said when a horse tosses his nose as high as his ears.